Tom Cruise, if you can imagine him free from the grip of Scientology, seems like a strongly driven, physically gifted, amiable movie star. We know he can act but as Ethan Hunt he gets to play with all the toys. 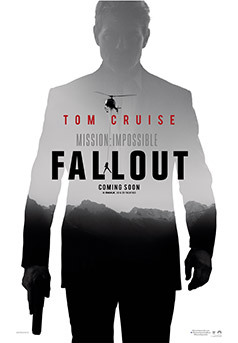 Camus accepts the latest impossible mission, MISSION IMPOSSIBLE – FALLOUT. “When we’re shooting these movies, we overshoot and over-explain everything, sometimes in multiple scenes. But information is the death of emotion... I can assure you there is a version of Fallout where the story is made perfectly clear. But you’d never know it because you'd be in the bathroom then. The trick is understanding what information matters and what holes don’t." There's a subtle difference between complex and complicated. The former is used to explain convolution with a positive spin and the latter muddies the waters a little. It's true that the plot of Fallout is convoluted but like its older brother, the James Bond** franchise, you do not go to see a Mission Impossible to care about plot or character despite the director's intentions and ambition. You go to get excited by action. Ethan will win. We know that. We also know because of some very insistent and ubiquitous marketing, that a great deal of the stunt work and action is performed on camera... Hang on. The ninth shot from the start and the last shot of the trailer is Cruise (in a helicopter) flying straight into an articulated lorry on what looks like an English country lane. It's not in the movie. Was really curious to find out how he'd survive that collision. I wonder why it was dropped... Ah, too much action, says director McQuarrie so we'll see it on the disc release. Right. Where was I? Oh, yeah. Ethan Hunt, despite the odd fictional cracked rib and the real bone break mid-shoot, is indestructible so how can we possibly care? The film crowbars in a few women for Hunt to care about so it's a proxy emotion if we manage to empathise at all. Say what you like about Tom Cruise though but there's a reason he's been a Hollywood star for thirty-five years. Yeah, I know. Makes me feel old too. I have friends in the film business who've worked directly with Mr. Cruise and they do not have a single negative thing to say about him. His enigmatic connection to Scientology tarnishes his otherwise impeccable reputation but that should have nothing to do with his day job. He has managed the seemingly impossible task of maintaining the wattage of his stardom with solid choices, great teamwork and a commitment to his craft that would shame a gold-winning Olympic athlete. Yes, he's had some ups and downs along the way and surprised us with tremendous supporting turns in Magnolia and Tropic Thunder but like most movie stars, Cruise is required to be star first and actor second. And there is no other franchise so committed to making it all seem so real than the Mission Impossible series. Having said that, the climax of Brian De Palma's first outing in 1996 was ludicrous in the extreme. Explosions rip human beings into meaty chunks in a millionth of a second. They tend not to roughly shove the hero away from an exploding helicopter. But then a franchise with 'impossible' in the title has to go some way to making the ludicrous palatable. It's much the same with Fallout. The action is clearly death defying but defiantly on the line of barely believable. Cruise does a jump out of a window high up enough for him to render both ankles and feet as two skin sacks of bone debris. At least he takes his time before dropping on to the hard surface and then sprinting away as if the impact with the neighbouring roof was an ordeal as dangerous as a three-foot drop. A synopsis at this point would be somewhat redundant. The basics are that there are naughty men and women trading in three nuclear devices and Ethan has to infiltrate the deal making process while facing up to the machinations of both the CIA and MI6 who all have schemes of their own. Along the way there is a modicum of action and a lot of it done for real for which the filmmakers should be applauded. This is the movie that a moustachioed Henry Cavill was yanked away from to reshoot Joss Whedon directed scenes for Justice League. CG is an amazing tool but it could not stop Cavill looking 'wrong' as his facial hair was animated out in his early scene. Cavill is terrific as CIA assassin Walker and is barely contained by a suit that has trouble stuffing Superman into it. Unsurprisingly he takes to fight scenes with a practised ease and is Cruise's equal in the selling of the punches both delivered and received. As usual, there are blows landed in the toilet scene that would not only knock out the strongest of people, but in some cases kill. We kind of brush past that stuff now, don't we? Should we? Odd how the filmmakers want to keep everything else 'real' except for the normal resilience of the human body. Sidekicks of old turn in good performances with Ving Rhames as Luther having the only what one might call emotional conversation in the entire, long running time. Simon Pegg's Benji steps up to the scaredy-cat comic relief plate with gusto. Alec Baldwin, taking time off from lampooning the world's most ridiculous human being, plays Hunt's boss who's also in on all the chicanery and double-crosses. Rebecca Ferguson as MI6's operative Ilsa Faust does a vastly credible action heroine while Hunt's ex-wife Julia played by Kiss Kiss Bang Bang's Michelle Monaghan is brought in to raise the high stakes as high as they can go. Sean Harris, whose distinctive face makes him a great villain, is terrific as the origin of all Hunt's grief. When he is finally thwarted and we see his reaction, face down on a wooden floor, I actually felt sorry for him. Where the film excels – which has little to do with characters' internal emotional relationships – is in the area of physical spectacle. There's a relatively simple mirror smash stunt which through carefully chosen angles and razor sharp editing (a nod to Eddie Hamilton's consistently great work) makes the audience wince in sympathy. The big set pieces are superbly performed and again, we are invited to take a lot of it on face value as real. 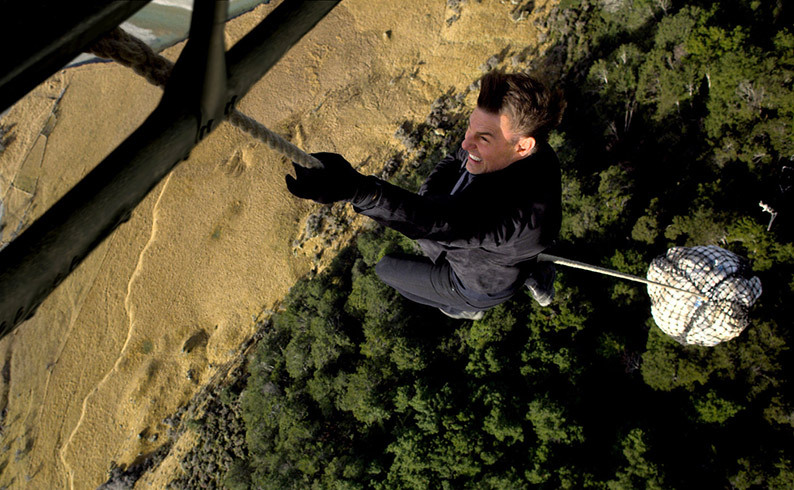 It's Cruise performing that HALO jump – high altitude, low open – introduced to the action movie lexicon in the 90s. We know it's Cruise sprinting over London landmarks because he probably has the broken ankle X-rays to prove it. Cruise even learned to expertly pilot a helicopter so like Christopher Nolan's 'for real' Spitfire aerial shots in Dunkirk, all those skies are really there and, as Simon Pegg has noted, it does give an extra dimension to the action. Not sure if Tom Hardy learned to pilot his plane but it seems to be Cruise really manoeuvring his chopper (that's enough giggling from the back). It's only at the climax, with a literal countdown when metal and stone start impacting human bodies, does the spectre of disbelief come knocking. Hard. But my favourite scene by some significant margin is one that must have come to McQuarrie in a flash of inspiration. It's midway through the movie and the IMF team has got its quarry and just as the bad guy, hooded, is being placed in the back of the car, the garage door goes up and exposes them to the Paris streets. A street cop, played sympathetically by Alix Bénézech, stands right in front of them trying to take in the scene. Suspicious, she is forced to take out her gun and Ethan steps towards her to try and get her to holster it and move off. 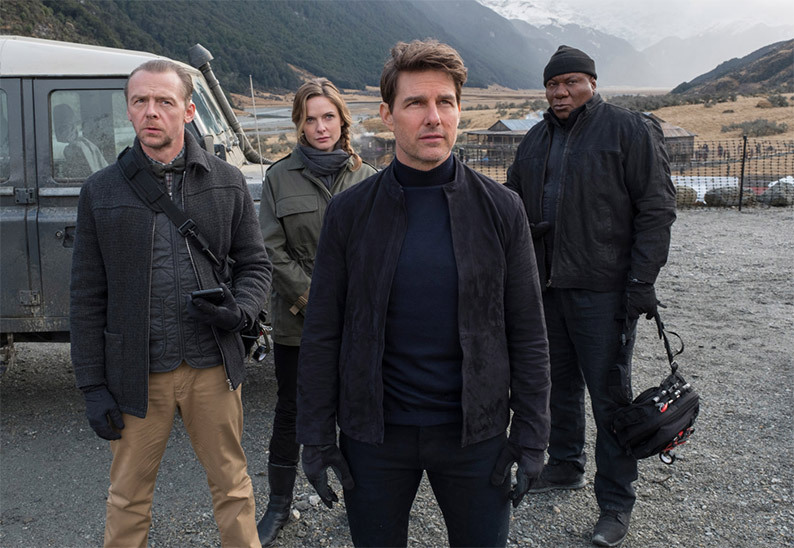 It's a rare moment when the plot impacts our world and the scene's resolution underlines Cruise's Ethan Hunt as a decent man in his indecent world... even if he does kill three bad guys in his decency. This kind of killing always reminds me of Marvin from Sin City and his line "I love hit-men. No matter what you do to them, you don't feel bad." And neither does the audience shed a tear for this nasty trio. Mission Impossible – Fallout is hardly an Outsider movie but as a big budget action picture, it's better than most and certainly has impeccable credentials. If you want a fun spectacle then Tom – as ever – is your go-to guy. ** The similarities to the James Bond franchise are more in place now and can't be ignored much longer. Bond and Hunt are invulnerable secret agents. Their core team consists of a technical wizard (Benji/Q) and a friendly fellow agent who both happen to be African American (Luthor/Felix). The action set pieces form the films' raisons d'être and globetrotting is de rigueur. It seems the only thing separating them in concept and execution is the date of their cinematic birth (Bond, 1962 and Hunt 1996). But to be fair, Mission Impossible first took to the screen in 1966 but Hunt was an invention for the big screen revival.